Master Games athlete Erwin van Beek talks about his approach, as a competitor and as a box owner, to CrossFit Open workouts. Open is upon us, so it is time to start thinking what strategy would fit best for the announced workout. 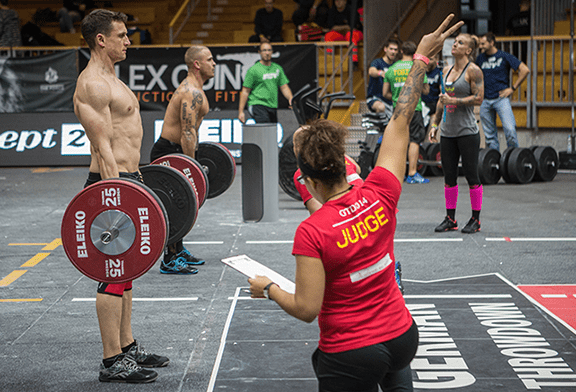 Before 15.1 was released we spoke to Erwin about general preps he does for the Open: as an athlete, and as a head coach/owner of Reebok CrossFit 020. Erwin van Beek has always been involved in sports: starting with Judo at the age of 4, wining more than 15 national medals. He graduated from ALO (sports academy), was drafted for the Royal Military Police Force and later worked for Dutch Police Academy where he was responsible for trainer education of special military and police unites. 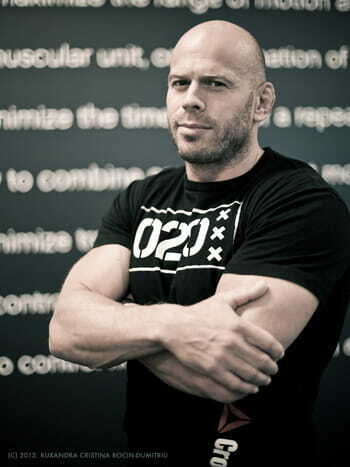 He found Crossfit in 2008, completed trainer certificates and opened his own box Reebok CrossFit 020 Amsterdam in 2010. Erwin is two-time CrossFit Games 40-44 Master athlete, finishing 4th in 2013. I try to go over the workout during the weekend, look at the rules and make a tactical plan. But having a family of five sometimes this needs to be postponed to Monday morning. It’s not rocket science but of course there are rules and you get some tactical things you should think about. The strategy is in the rules we get along with the workout. For me it’s important to be free of other thoughts and willingness to go hard! Do my best and try to qualify further. I don’t look too much at others and check their scores. Enjoy, don’t have unrealistic expectations and think you’re a champion. Enjoy the process first and the reward will come. But that doesn’t mean you should not be focused and serious about it. Yes. If you want to see where you stand, you need to be fully recoved before the workout. And no, if you have another goal. For example we have a national competition starting in Sept./Oct., and some people can’t qualify for Regionals, but can progress on to the Nationals. With that in mind my advice would be to just include the Open workouts in the training plan knowing you might actually be able to do it better fully recovered. Yes, in relation to my first answer above: all I do in the Open are those workouts and rest as much as possible. No, if your goals are outside the Open (local competitions) and they are more important. Normally I do the WOD only once, because of my busy schedule. Most of times I only have one opportunity to do it. However this year I will try to do it on Friday as my first attempt, and if I won’t be satisfied with a result, I’ll do it again on Monday. The good thing about doing it twice is you get a feeling where you could go faster or where you should slow down. The downside could be you’re not fully recovered though. Especially when you hit the WOD with everything you got and do it again within two days. In other words you need complete recovery. Friday if possible and then Monday again. Monday is usually my Open WOD day. Like I said I don’t look much at other competitors. But I do try zo get all out with every workout. I think adjusting the effort can be dangerous to slip down the leaderboard. I’m not in a position to do that in this strong field of competitors. Pacing the workout depends on the movements included. It’s usually a natural things as we all have strengths and weaknesses. So you speed where you can to compensate things that hold you back. We want to give the experience to as many people as possible. On Monday we programme it as our regular WOD and all people coming that day are doing it (RX or in a scaled version of course). The people who didn’t sign up do it as others who did. The reason why we judge everyone is to give them the experience of being judged in a WOD. Also they need to judge other people as well so they get a double learning curve about movement in general. So Monday all day is an “Event” day and lots of people stop by to watch too. Also we give people a chance to do the Open WOD on Friday/Saturday/Sunday Open gym time so in a way the whole weekend and Monday it is all about The Open.